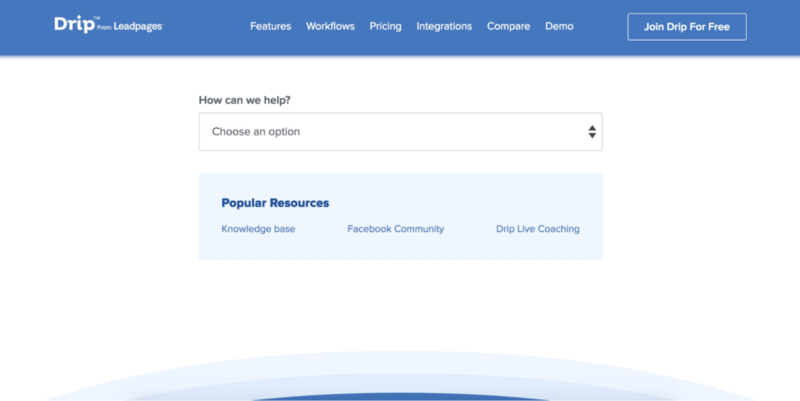 Drip is a new email marketing tool recently purchased by the guys at Leadpages. It combined powerful marketing automations with easy of use but it has some quirks you will need to deal with. Drip offers a comprehensive feature-set that’ll handle virtually anything you can throw at it. It’s up there with the more expensive email marketing tools, but one of the few that offer a free plan. Given the extensive functionality Drip is surprisingly straightforward, though still not ideal for beginners. Several high-quality support channels available. No phone support though, and free plans are also very limited here. 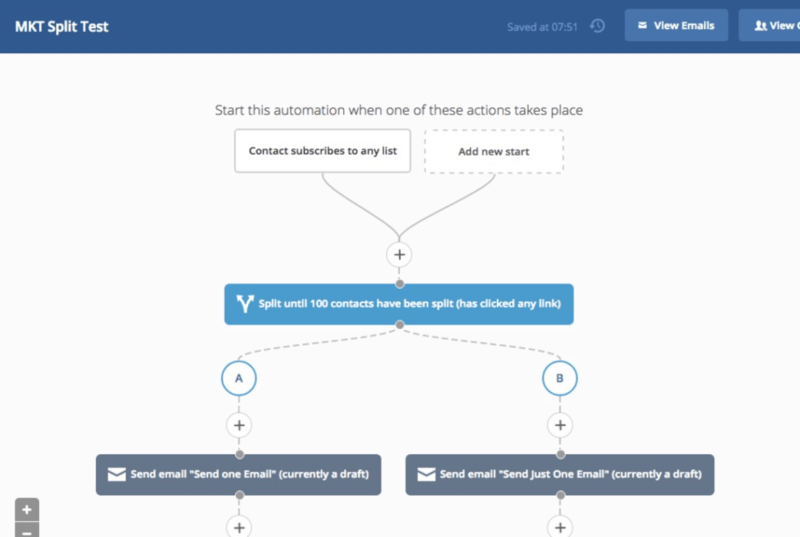 Drip is an automation-focused email marketing tool, acquired by the guys behind LeadPages. It also one of the newer tools in this review series (entering the market in 2013). 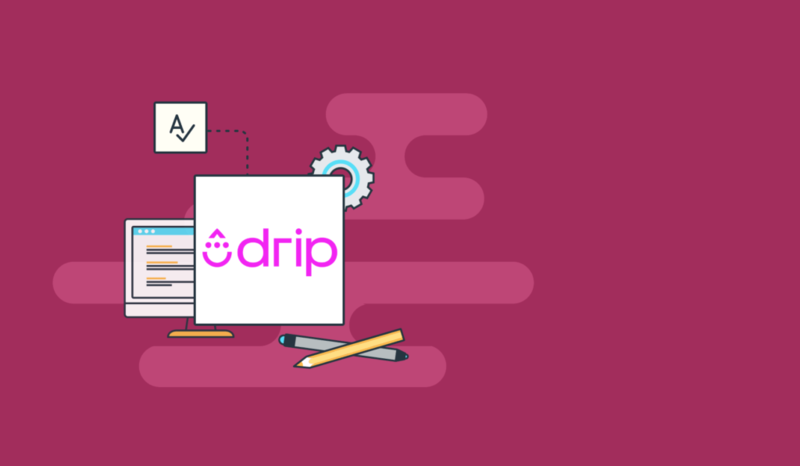 Despite going up against very established and well-funded competitors, Drip has grown into what many would consider the leading email marketing platform around today. 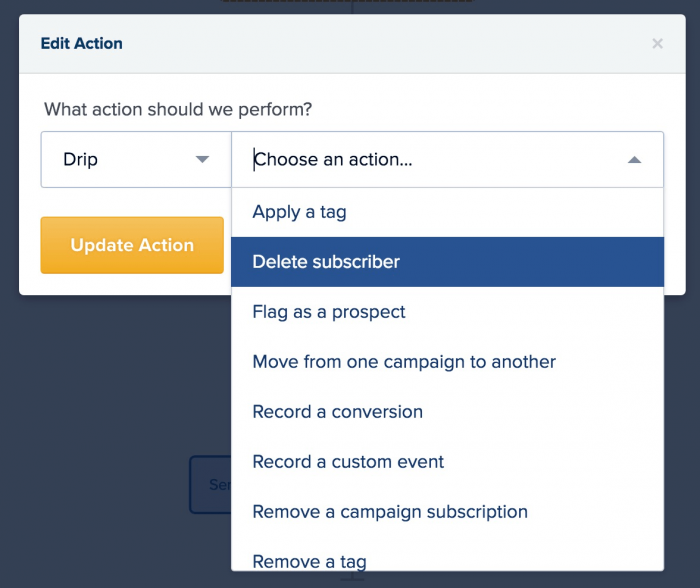 The question is, how well does Drip work for email marketing? For this review, I fired up Drip to see how it performs as a standalone tool, and in comparison to popular alternatives. 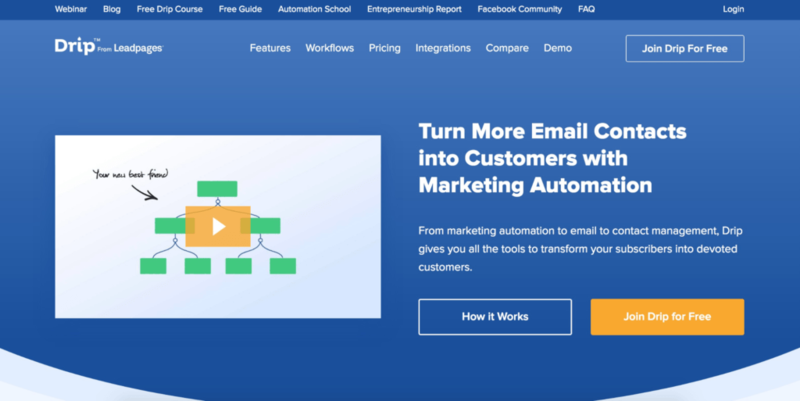 If you want a more in-depth breakdown of the process I used to review Drip, I suggest you check out my email marketing tools roundup. And this system makes it painfully easy to set up granular, behavioural-based tagging, just by swapping out the initial trigger. For example, if I want to tag subscribers who clicked a specific link in one of my emails, I just look for it in the trigger menu. 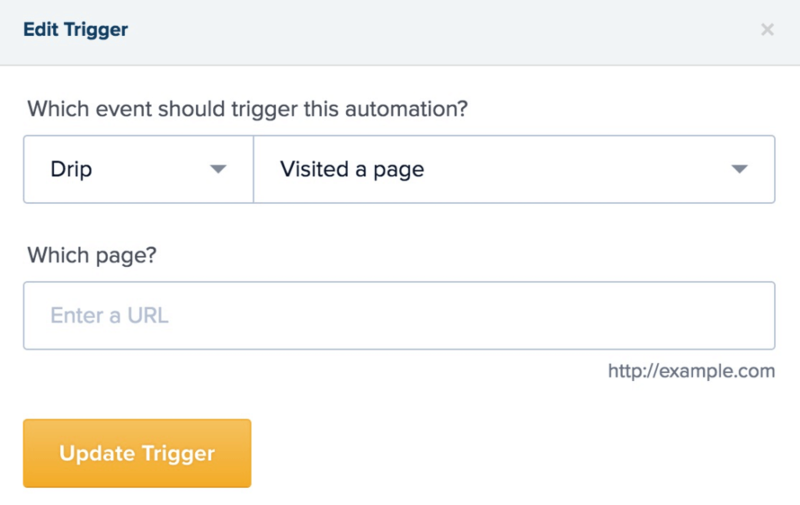 And after installing the Drip tracking code on your site, these “trigger links” can also be placed on any of your pages as well. Not only that, but it allows you to track and tag subscribers based on the pages they’ve visited and interacted with on your site. This is useful for creating things like cart abandonment campaigns, timed info product delivery and even click-based onboarding emails. The segmentation capabilities of this tool feel almost limitless, and I haven’t even properly covered “events” yet. Events work similarly to tags, except they’re time-stamped and can be applied multiple times. They also tend to be automatically applied to subscribers via third-party integrations. An example of this might be if a subscriber purchases a product through ThriveCart, you could use that event information to target anyone who purchased a specific product in the last 6 months (or whatever). Drip is a segmentation and subscriber management machine. Nuff said. 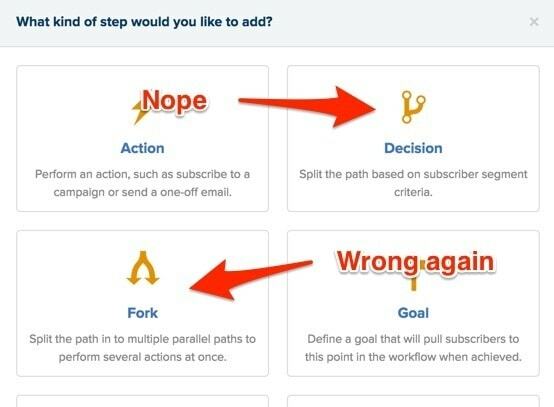 Being an automation-focused email marketing tool, this is the part I was most excited to dive into. The first thing to note is that there are TWO ways to build automations. Workflows and Rules. The “Workflows” option gives you a visual automations builder than can branch off based on various conditions. Rules remind me of ConvertKit with the whole “trigger and action” system, which, as I also pointed out in my ConvertKit review, comes with it’s own set of problems/limitations. If you want to set a simple, quick, one-off automation rule, then you’ll probably appreciate the inclusion of a more barebones interface. 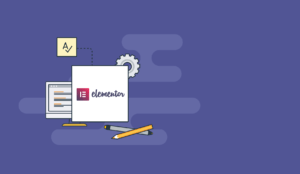 But if you’re an automations ninja who’s looking to get the most from this tool, you’ll definitely want to use the Workflow builder. Now, coming from ActiveCampaign, I immediately noticed a difference in speed performance. There’s really no comparison, Drip is just significantly faster. In terms of raw power though? It’s a real tough one to judge. Initially, it looked as though ActiveCampaign had more to offer in terms of conditions and contact actions, but the more I dug into it, the more I attributed that to Drip’s simpler interface. Granted, ActiveCampaign does offer slightly more triggers and actions over Drip, but as hard as I looked, I couldn’t find any significant limitations with Drip’s automations in comparison. The only thing I didn’t like was that some automations are created from other areas of the tool. 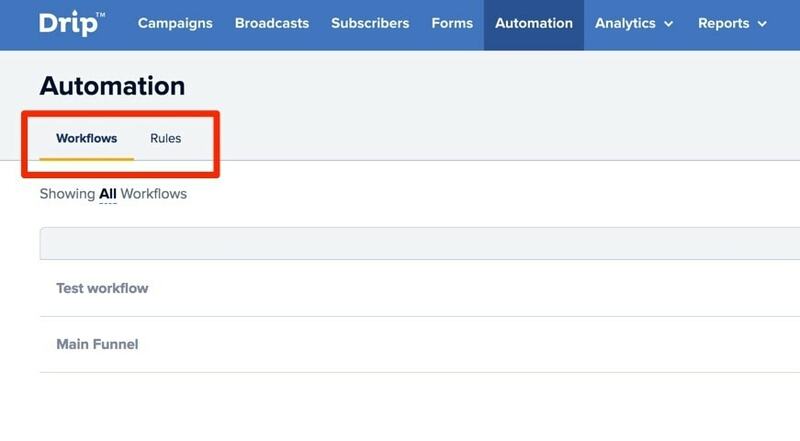 For example, forms have a separate automations builder to, say, campaigns. I can see this becoming problem knowing where particular automations live as you scale up. One final thing I’d like to squeeze in here is the ability to automatically resend broadcasts to anyone who didn’t open. Though you can do this in ActiveCampaign later, Drip makes it easy by simply checking a box before sending. It’s small but practical things like this that ActiveCampaign seems to overlook, and it allows newer tools, like Drip, to maintain a strong position in the market despite having fewer bells and whistles. 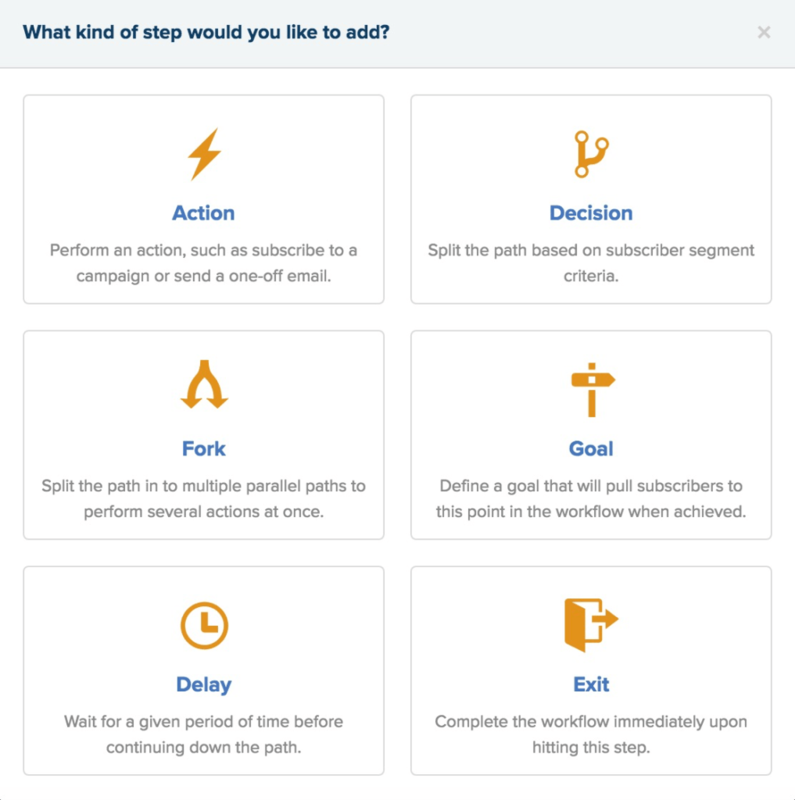 Aside from the slightly confusing management aspect of different automation rules, Drip absolutely delivers on it’s promise of being a straightforward automation-focused email marketing tool. Under the “Analytics” tab, you can find the option to create a new split-test. From here you’re able to test different subject lines, ‘from” name, and delivery timing, which is always a good start. But it’s still pretty basic stuff considering the hype around this tool. What I was really interested in was testing email content. 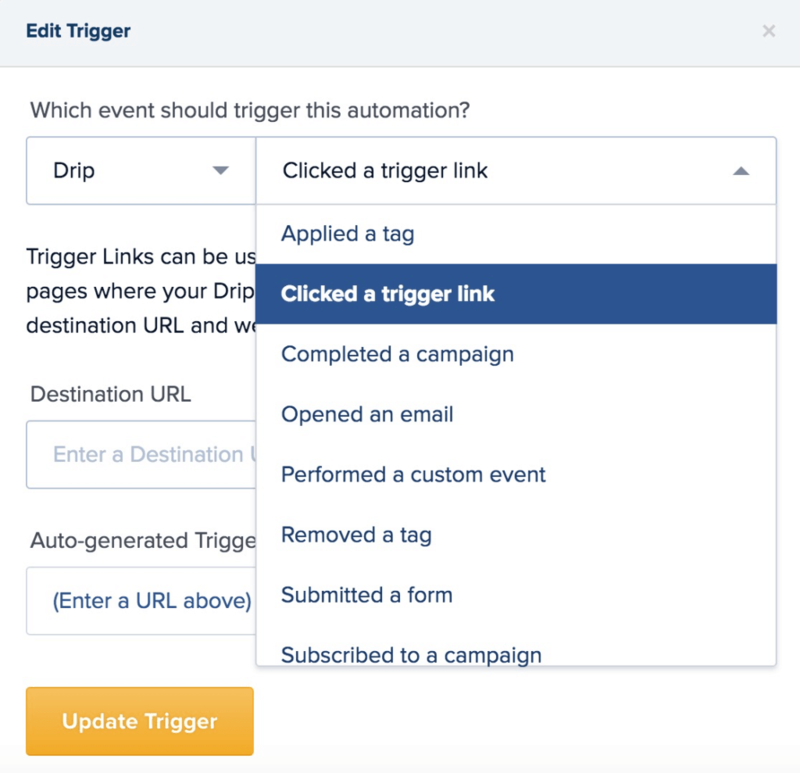 This is something a lot of email marketing tools skimp on, and unfortunately, Drip doesn’t seem to be an exception to that. 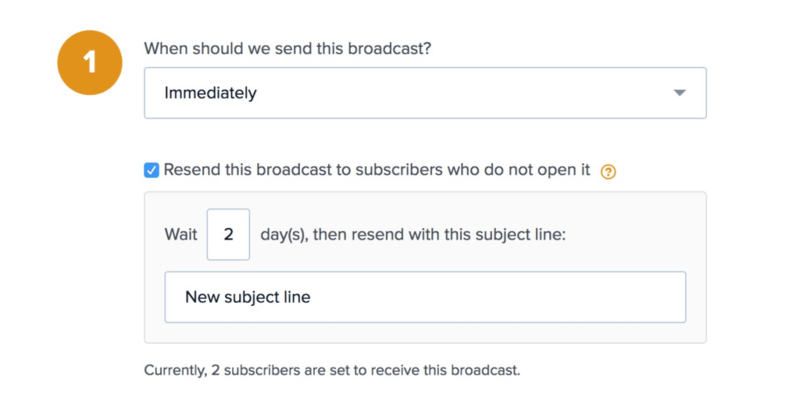 It is technically possible to achieve this kind of test by using tags to break your subscribers into two “buckets”, but this is more of a complicated workaround than a real solution. And it’s worth mentioning this is something you CAN do with ActiveCampaign. It’s a shame, because judging by what I’ve seen from the rest of the tool, you wouldn’t expect to find these limitations. 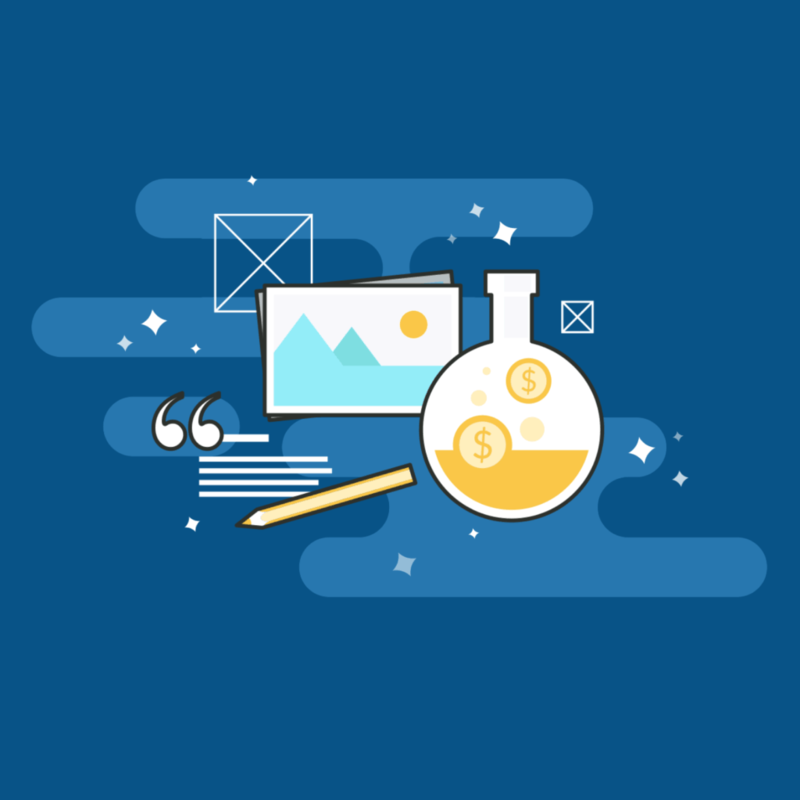 Drip offers a reasonably good A/B testing environment, but if you’re looking to test your actual email content then you’ll have a pretty hard time with this tool. I really like Drip’s forms builder. Aside from design, which I’ll get to in a sec, you can pretty much control every aspect of your form. Post sign-up copy, orientation, behaviour, visibility, redirect, triggers… you name it, and you can almost certainly play with it. And even with all these options to sift through, it somehow never feels messy or overwhelming. You can also choose between installing your form as a widget, embed code or just using a hosted version. As I said though, the one thing I didn’t really click with is the design customizer. It’s way too basic, especially in comparison to everything else you can do with the form builder. Finally — and I mentioned this earlier in the review – you can build form automations directly from the form builder. 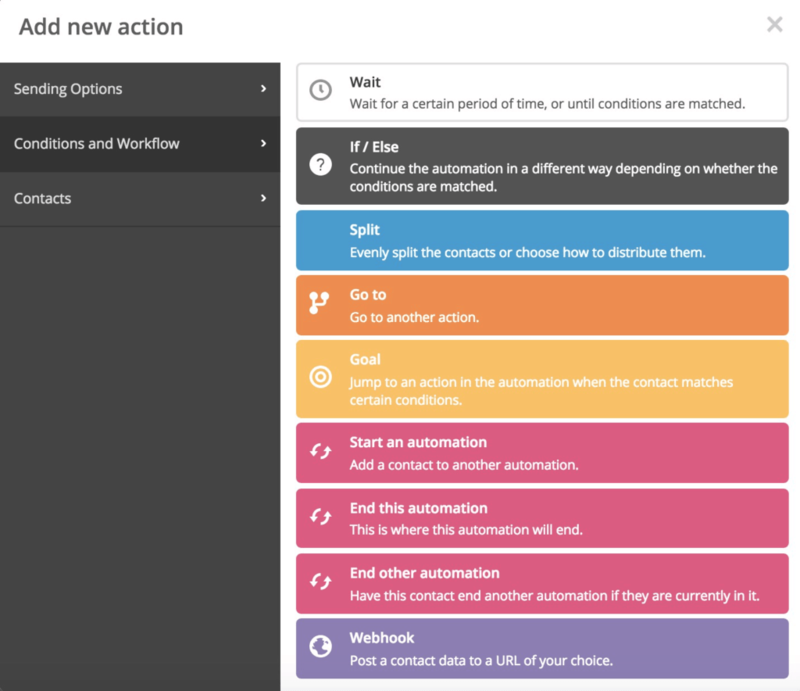 While it does open up some problems with organizing and managing your automations across the platform, I did like being able to create tailored automation rules for individual forms. 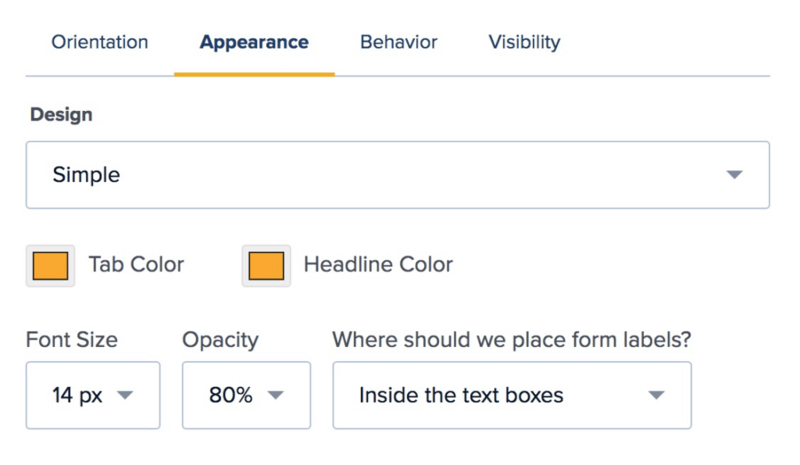 If you’ve been caught up in the page builder hype, it’s likely you’re using something like Thrive Content Builder or LeadPages. If that’s the case, this section likely won’t be relevant to you anyway. 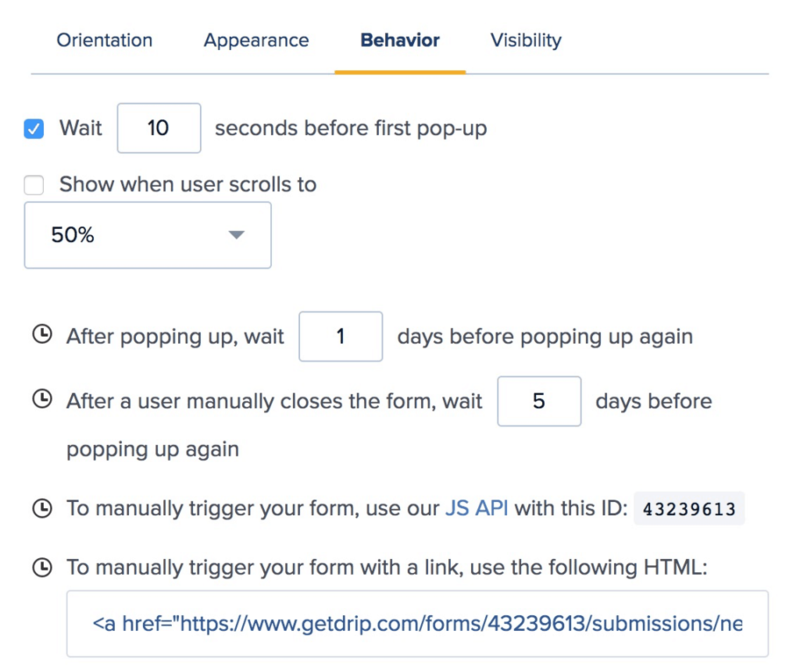 Drip’s form builder is admittedly lacking in design customization, and that could be a deal breaker for some. But, personally, there’s so much more to like here that I can almost forgive the design limitations. Almost. Straight away I could see that Drip’s integrations weren’t as comprehensive as other tools. It does hook up to Zapier though, which opens up a bunch of other potential integrations through their “Zap” system. Even though the numbers don’t favor Drip in this case, it’s important to keep in mind that the more popular integrations almost always get priority. I mentioned this in my ConvertKit review, but it’s almost like the 80/20 of integrations. For most people and most technical setups, they’ll have you covered. Unless you’re using really obscure applications, you likely won’t need to worry about this aspect at all. 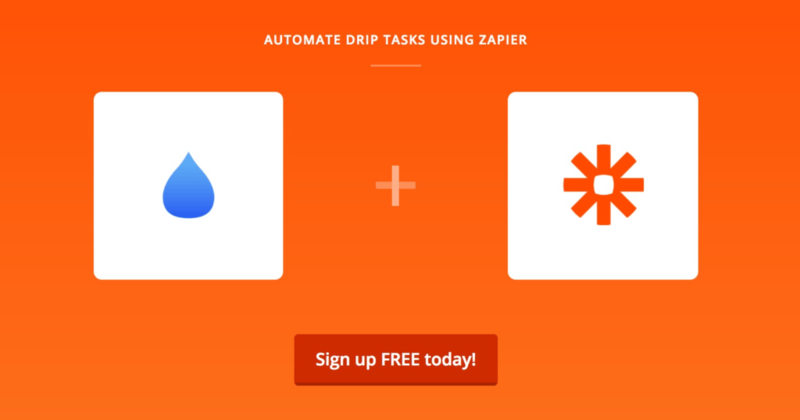 Of course, it’s always best to check Drip’s complete list of integrations as well as details on the Zapier integrations before jumping onboard. Just in case. 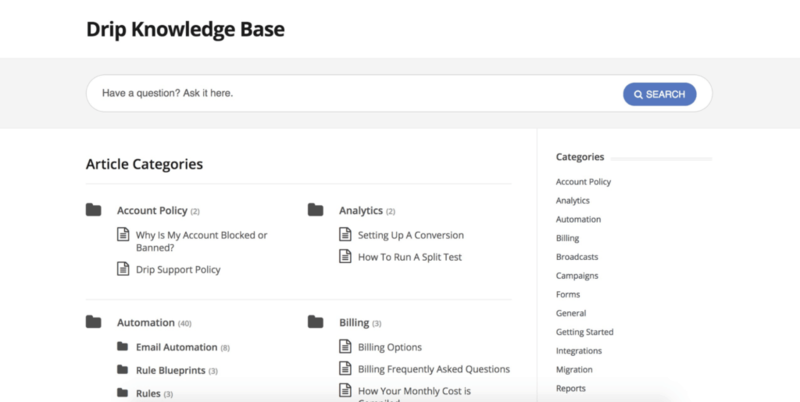 Your main Drip dashboard shows a complete breakdown of your site from an email marketing perspective. That’s everything from page visits, form opens, subscriptions and conversions. Keep in mind, you’ll have to install the code snippet provided in order for this – and various other features – to work. From there, you can head into your “broadcasts” (essentially just one-off emails) to see individual reports. From here you can get a sense of how each email performed in terms of opens, clicks, conversions and unsubscribes. For “campaigns” (or autoresponders), you get access to pretty much the same thing, just with a few tweaks to the metrics being tracked. In that case, you’ll only see subscriptions and conversions. Last, but certainly not least, you have a dedicated “Reports” page that breaks down a series of other email marketing aspects. These include things like subscriber growth, hard bounces, and even opens by hour. If you like diggin’ into the numbers, this is where you’ll get your fix. It’s safe to say that it goes well beyond the basics, but more importantly, it’s a piece of cake to carve out the exact data you want. 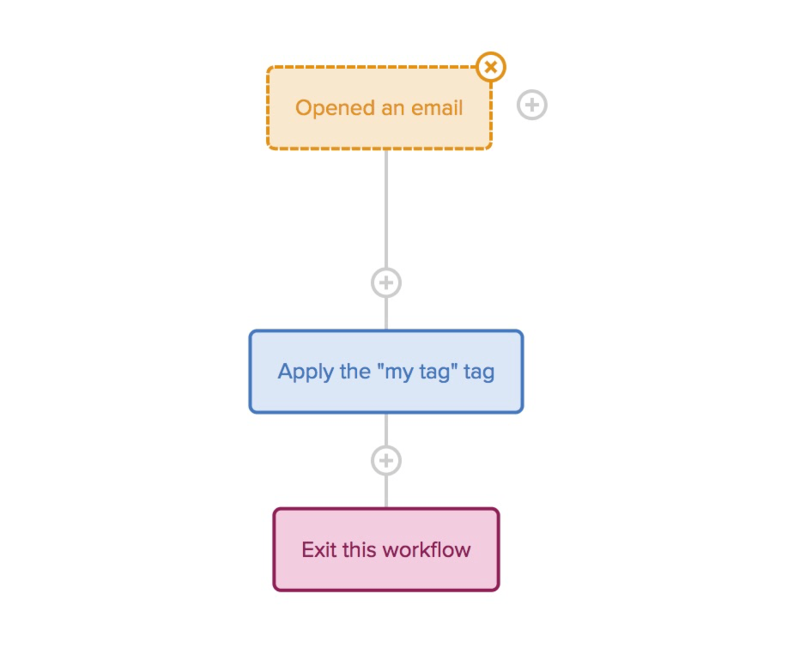 Definitely one of the better email marketing tools when it comes to tracking and reporting. For a lot of people, this is a HUGE factor to consider when taking the plunge with any tool, let alone something that’ll likely be at the helm of your marketing strategy. So what support channels are available? 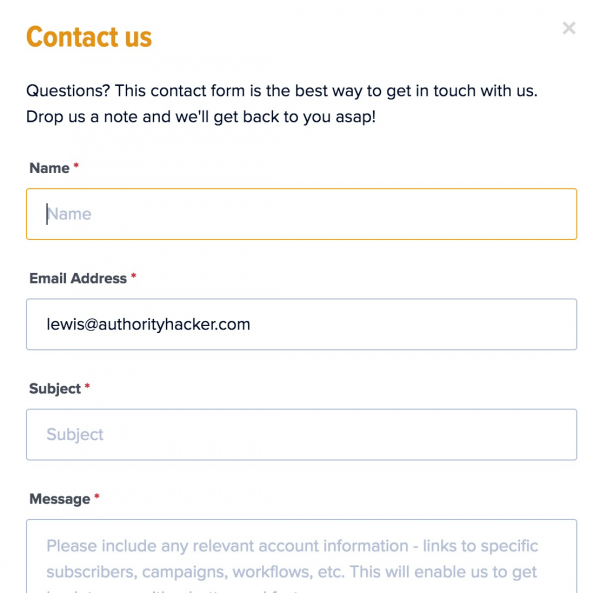 Well, as you would expect, you can contact Drip via email using their contact form. I shot a couple emails off to test the response time, and I found it to typically be anywhere from 24-48 hours which is not terrible. Fortunately, the responses I got back were excellent, so there was no need for a ton of back and forth communication. 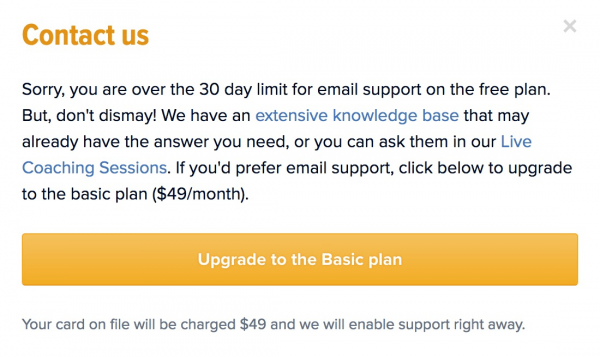 One thing to be aware of, however, is that email support is limited on the free plan. Outside of that, you can search the knowledge base which I actually found to be super thorough. 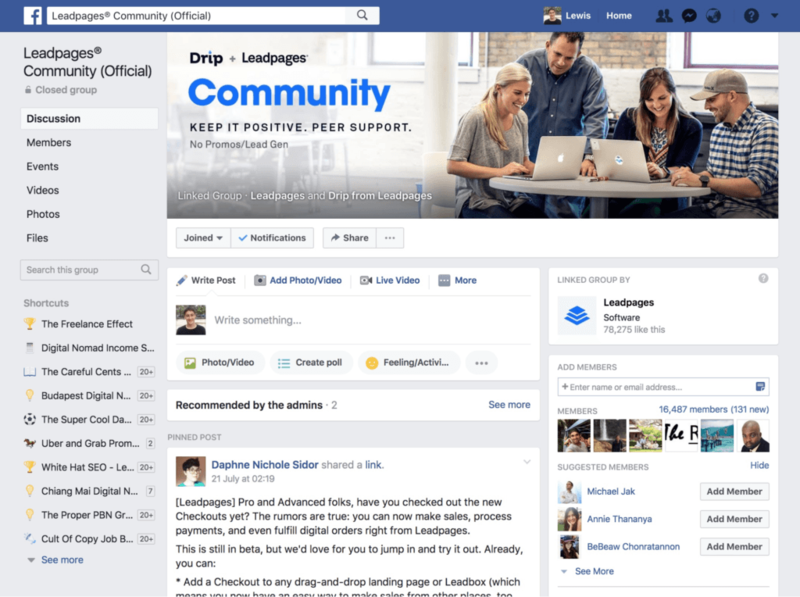 The only downside to the group is that it’s a “LeadPages” group and not a “Drip” group. Sure, it’s all owned by the same company but it means a broader scope of discussion amongst members. Not ideal. The webinars are based on various topics around marketing (not just email marketing) and you can even watch past replays. For me, live chat is my go-to when it comes to support, and although I find it tough to catch them online at the right time, the support rep clearly knew his stuff. One thing I should point out is that, as hard as I tried, I just couldn’t find a phone number on their website. Could be a deal breaker if you prefer this support option. Apart from a certain lack of support for anyone on the free plan, which I think is totally understandable, and the whole “no phone number” thing, Drip’s support as a whole is up to scratch. From our own testing, Drip achieved a respectable open rate of 36.1% in the given time frame. Is Drip Right For You? Now that I’ve covered all the different features and functions of Drip, weighing up the pros and cons and giving my experience along the way — let’s talk about YOU. As with any tool, Drip isn’t going to be the right choice for everyone, so I’d like to get to the bottom of who exactly this email marketing tool is suitable for. If you’re looking for email marketing on a budget, Drip is a bit of a tricky one to decipher. Looking at this alone, it’s clear that Drip is easily one of the more expensive options on the market. What keeps this horse in the budget-friendly race, however, is the fact that they have a full-featured free plan for up to 100 subscribers. It won’t take long before you exceed that limit. Could be weeks, or possibly a couple months if you’re growing at snails pace. After that, you’ll be forced to pay $49/month to continue using the service. If you want something a little more powerful and you are willing to cough up some dough in the near future, Drip will be a solid choice. One of the key reasons I love Drip is that it manages to keep things fairly simple without holding back on functionality. It has most of the raw power you’ll find in ActiveCampaign, except it’s faster, cleaner and more intuitive on so many levels. That said, there’s still a slight learning curve to Drip that I think some beginners would struggle with, which is why I recommend having at least some experience with email marketing before tackling this beast. 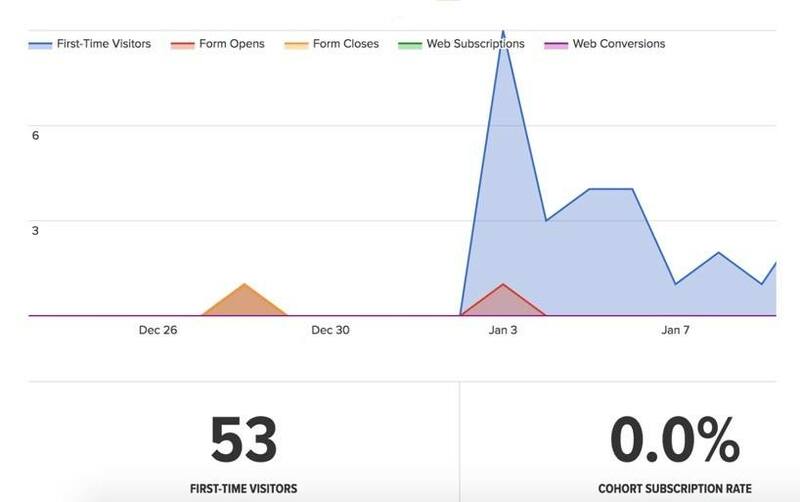 If you’re fresh off the boat, I’d suggest something like ConvertKit or MailChimp to get started. Besides, it’s unlikely you’ll need the more advanced features of tools like Drip and ActiveCampaign at such an early stage. THIS is where I can go full ham on recommending Drip. Look, if you know me, you’ll know that I’m a massive advocate of ActiveCampaign. It’s not perfect, but it’s an email marketing powerhouse nonetheless. For me, Drip feels like a slicker, somewhat lighter version of ActiveCampaign that’ll still handle virtually anything you can throw at it. 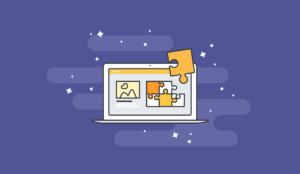 Yes, it’s lacking things like email templates, custom lead scoring, a built-in CRM, and slightly more advanced automation capabilities — but these things do come at a cost. Drip is considerably faster than ActiveCampaign, and building marketing automations at scale is INFINITELY more efficient with Drip. Time is money, after all. Of course, the reason many people put up with the sluggishness of ActiveCampaign is mainly due to price. A Drip subscription is roughly 50% more expensive than ActiveCampaign. The bottom line is, If moolah isn’t a factor and you value raw speed and efficiency above all, get Drip. 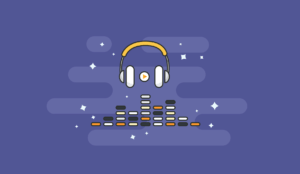 Drip is one of those tools that I couldn’t stop hearing about, but just never got around to testing… until now. Fortunately, it turned out to be one of the few tools that managed to live up to the hype, and it’s easy to see why it’s as popular as it is. Despite a marginal defeat by ActiveCampaign in my roundup comparison, Drip has a magic about it that, for some reason, I can’t quite depict with a data-driven approach. The good news is, you don’t have to take my word for it. With Drip offering fully-featured free account, you have nothing to lose by simply giving it a try. Drip used to be great – I’ve been with them from the early days. But, I think it’s worth noting that they’ve been having a lot of issues lately. From workflows not firing or getting stuck to support issues left unanswered for literally a 10 days, regularly – they’re clearly struggling. I’m sure they’re going to get this stuff sorted out at some point, but, for now, and for about two months now – this is the state of things in Drip. A bit unfortunate, really, since it’s such a good system when it works.